There are many fantastic museums throughout Lapland where you can learn about the Sami people (Sápmi in Karasjok, Siida in Inari, and Arktikum in Rovaniemi to name a few), but one of my most fascinating glimpses into the Sami culture was at a small farm in Finnish Lapland’s far north. There, I was given a first-hand look into the modern life of the Inari Sami, a small group of Sami that have always lived in the municipality of Inari. Tula, our guide and the owner of the farm, is an Inari Sami that is part of the second generation of her family to live all year in the same house. That house was built 60 years ago by her father as the Sami, traditionally a nomadic people, began to settle. This was brought about largely by the advent of the snowmobile, which eliminated the need for the Sami to follow their herds. Snowmobiles were a much more efficient (if significantly louder) way to travel through the wilderness the previous preferred mode of transport, the reindeer-drawn sled. 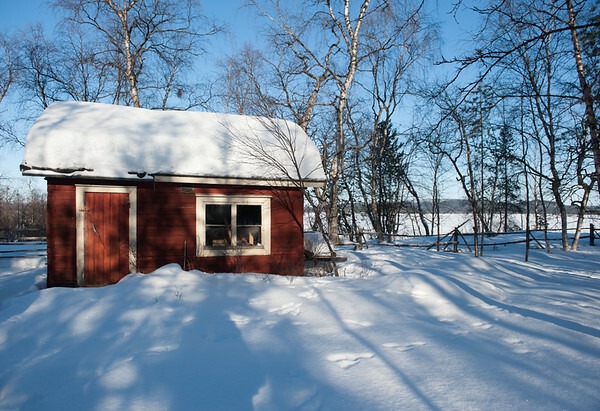 No Finnish property would be complete without its sauna. 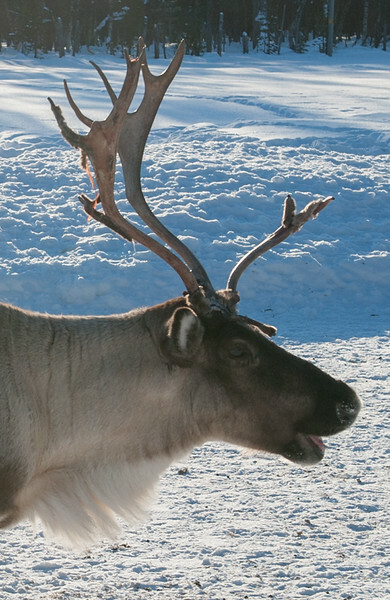 These reindeer are more like “members of the family” than wild animals. They live within the property year round, so they seemed even more tame than their semi-domesticated brothers that roam the countryside. 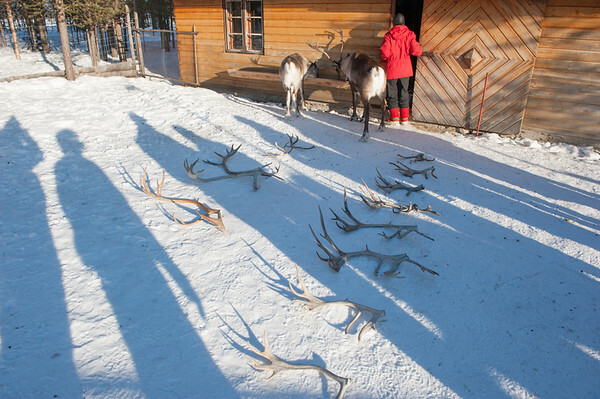 We were allowed to walk around in one of their pens with the only restriction being “don’t get too close to their antlers.” The reindeer weren’t exactly the type to put their heads down and charge, but they wouldn’t understand the damage they could do just by swinging their heads. Tula explaining the importance of lichen in a reindeer’s diet. Luckily, there were no injuries as we held out our hands to the reindeer, offering up fresh “reindeer moss” that Tula had shipped in by the bag. Reindeer survive all winter by digging up this hardy lichen around the fells of Lapland, but this herd was much more likely to exhaust their supply since they spent all year foraging on the same land. Plus, it helped to have something that tourists like us could feed them without having to dig it up for ourselves first! As the reindeer munched, Tula told us about her small herd. Usually they would be led by the oldest female, but because there were no females old enough, they were led by Valokki, the oldest male whose name is one of the many Sami words for cloudberry. Two are chosen for slaughter each year (to provide food for the family), but Tula said it was the worst part of the year having the choose which two. The reindeer certainly weren’t shy about asking Tula for food! Each had a mark cut into their ear that was unique to Tula’s family. These marks are crucial for roaming reindeer; during the big roundups in May and October when there can be tens of thousands of reindeer in one place, the marks allow herders to identify their animals. 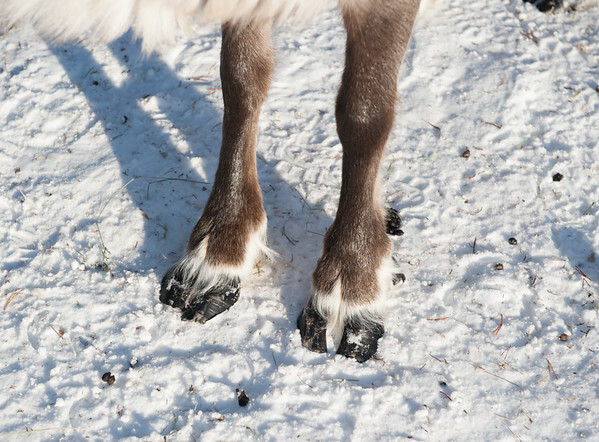 ALL reindeer in Lapland have these marks, meaning that all 200,000 or so reindeer are owned by someone. What happens if a reindeer is owned by someone else and then sold, like the poor little white reindeer that kept getting chased across the yard by the others? In this case, the reindeer had a bright red string hanging from his ear to identify that he is no longer owned by the same person. If this reindeer was found outside the farm, the original owner would be contacted and would let the finder know where he now belonged. A lot of us had questions about the reindeer’s antlers, since some of them had one antler, some had gnarled antlers that looked like they were trying to fall off, and a few had none at all. Reindeer grow their antlers in the summer; at this point, they are living tissue coated by a healthy layer of soft velvet. If you look closely at a set of antlers, you can see the imprints of the veins that once delivered blood to them. By winter, the antlers have solidified and become more like hair, in that the tissue is no longer living, the velvet has peeled off, and the reindeer no longer feel sensation in them. At this point, the reindeer can lock antlers with others, as it would be too painful while they are still growing. To help explain antlers to us, Tula laid out a line of them from previous years. It was interesting to see the similarities between the antlers from a single reindeer. Each year was a different size, growing larger until it reached a certain age and then gradually getting smaller and more gnarled. However, they all had a similar shape to them that was specific to that reindeer. Reindeer antlers, lined up by animal and year. So why such a focus on reindeer? What do they provide that is so important? As mentioned above, reindeer used to provide the primary form of transport for the Sami. Now too slow compared to snowmobiles and cars, they mainly pull sleds for tourists. Because reindeer are one of only a few “farm” animals that can survive the harsh Lapland winters, their meat is very important. I found that it was served more often than most other meats and was much more delicious. I will be writing an entire post on reindeer and all of the different ways it can be eaten, but suffice it to say that — from smoked reindeer to reindeer burgers — I loved almost all of it. It’s a tasty meat that is nothing like deer…in my opinion it is much better! 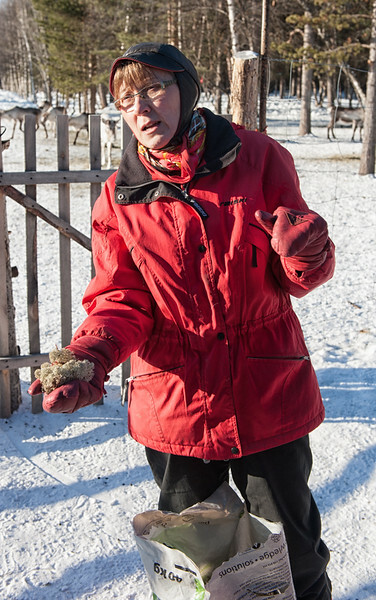 Me befriending the reindeer with a handful of lichen. They are also an important source of clothing for the Sami people. Without reindeer fur, which is naturally hollow to help insulate from the cold, the winters would have felt very cold indeed. The fur can be used for everything from tents to jackets, but I personally found the most interesting use to be in the Sami shoes. These shoes, with their trademark curl at the end that originally helped to keep their skis from slipping off, are still cut and stitched completely by hand. After inviting us into her living room, Tula showed us some finished boots — very similar to the ones she had been wearing outside in the snow — as well as a pair she was working on. After the skin has been through the proper drying process, the boots are stitched inside out and then very carefully pulled out into their final shape. Man did it look difficult to get that toe curl just right! Tula telling us about how Sami shoes are made. The shoes are clearly very warm since I saw people throughout Lapland wearing them, but they would take a bit of getting used to. Not only do they have a furry sole that provides much less grip than a standard snowboot, but they have “shoegrass” stuffed inside them to help insulate and wick away the sweat. One of the girls on our tour tried it on and said it was quite comfortable, but I think it would be a feeling that would take some getting used to! While the Sami could not have survived without reindeer fur, not all of their clothing is made out of it. Most of their traditional costumes — in the case of the Inari Sami, a relatively simple design in brilliant hues of green, red, and yellow — are woven fabrics. Tula walked us through weaving the laces that keep her boots secure around her ankles and showed us some of the different designs that various groups of Sami would wear. This made the costumes I saw at the Sami Easter Festival a few weeks later a lot more meaningful to me! Tula truly gave us an interesting peek into the world of the modern Sami, particularly the Inari Sami. While I enjoyed my visits to the museums in Lapland, it was at the farm where I felt like I really started to understand the Sami’s unique connection with the animals they herd. 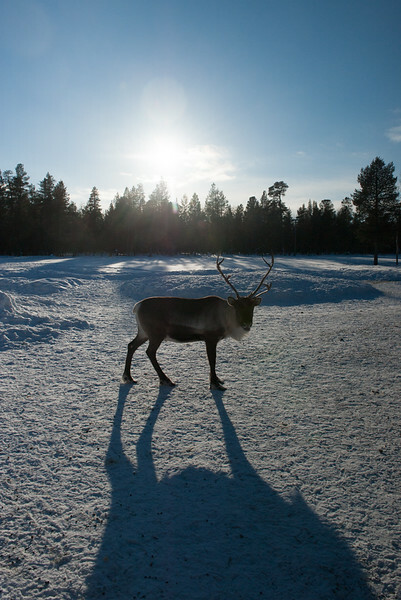 Snow, gorgeous sunlight, and reindeer. A scene repeated so many times across Lapland but always just as gorgeous. 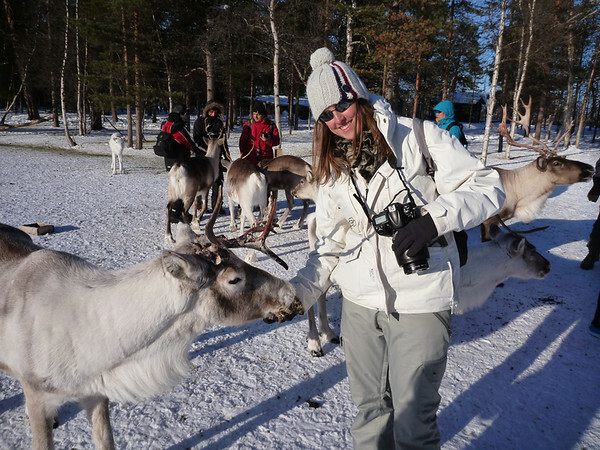 I did the ‘Explore Reindeer and Handicrafts’ tour courtesy of InariEvent. Trips to the farm run every Wednesday from 2pm-5pm (including round trip transfer) and cost €85. From Diversity in Saami terminology for reindeer and snow, written by Dr. Ole Henrik Magga, Professor of Saami Linguistics, Saami University College in Guovdageaidnu, Norway. Truly fascinating post Kristin and you go into a lot of detail with many interesting facts. I think I too would dread choosing two reindeer a year from my herd. Thank you! I found the Sami culture to be fascinating — especially their close connection to the reindeer that they herd. And I agree — it would be awful to have to choose two reindeer a year. I don’t know if I could do it! Hi Kristin could you leave the contatc of this farm, I’m really interested to going there.Thank you. Hi there Bastien, it’s great that you’d like to go to the reindeer farm! 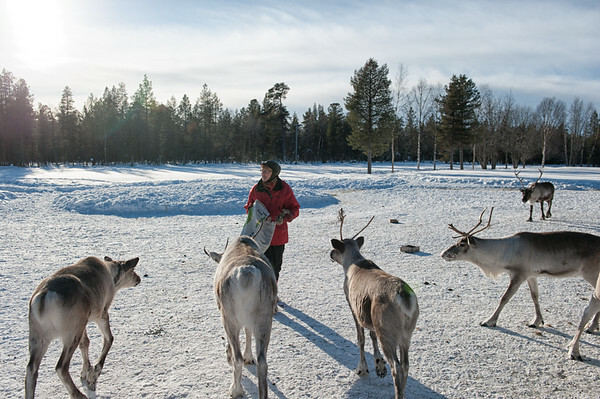 I don’t have the contact info for the farm itself, but you can get in touch with Visit Inari through their website here –> http://www.visitinari.fi/en/plan/weekly-program-winter/explore-reindeer-and-handicrafts-wednesday and they will be able to let you know anything you want about the tour. I live in the U.S., but I am of Saami descent. I practice shamanism, and Reindeer is one of my most important guides. I would love to find a pattern for Saami shoes, or perhaps to purchase some to fit me. Hi Barbara, unfortunately I don’t really know where you can purchase Sami shoes outside of actually being in Lapland (which is where I came across them). I think a Google search is your best bet! Lucky enough to fins such a pattern! !